Mike recorded his account of the Christmas Day escape in an interview in 1968. Mike's father, Dr Arthur Leman Kendall was a physician/surgeon, and secretary to the Canadian Alpine Club. Mike had a twin sister Kathleen and a younger brother Arthur. Colin McEwan MI9 : "Mike was engaged through Colonel S. K. Yee and Admiral Chan Chak. They were the Nationalist government's representatives in HK trying to establish contact with the guerillas in the HK border area, whom we would supply with arms in turn for their interfering in the Japanese lines of communication." Lieutenant Commander Gandy R. N. (Rtrd) "I cannot speak too highly of Mr. FW Kendall's service and advice to the party." Norman Halladay MN: "I finnished up with an army boot on one foot and a shoe on the other." Thirty four year old Mike Kendall was a Canadian mining engineer from Vancouver who had lived in Hong Kong since childhood, and spoke several local dialects fluently. He abandoned his mining business in China when the Japanese invaded and moved back to Hong Kong. There he worked for the Government organizing refugee relief, building and running the large camp at Kam Tin. Late in 1939 Kendall was approached and hired by MI9 as a field operative. He was asked to set up a small unit of volunteer civilians to work under him within the "Ministry of Economic Warfare" in Hong Kong to undertake surveillance duties. This was in effect a branch of the SOE which had been formed on 22nd July 1940 operating out of Baker Street, London. Kendall, under the cover of the camp building project was responsible for agents and operatives as well as installing and maintaining a network of radio communication stations in the Japanese occupied surrounding areas as far north as Formosa, now Taiwan. Because they tapped into an existing Chinese network, the intelligence it was able to access was far more sophisticated and accurate. Kendall along with his right-hand man Teesdale undertook training for subversive activities in Singapore. On their return to Hong Kong they recruited a team of volunteer European civilians for subversive activities, creating diversionary tactics etc in the event of a Japanese invasion of British Sovereign Territory. Being non military personnel, they could undertake “ungentlemanly warfare”, which the official armed services could not legitimately carry out. The unit was given a cover name of “Z Force”, training and operating in absolute secrecy. Among the volunteers were a Russian born businessman named Monia Talan, and a P. E. instructor Colin McEwan. 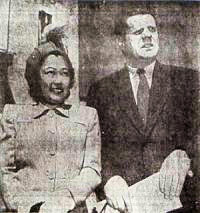 They met secretly at a camp near Kam Tin, each weekend, usually trained by Teesdale, as Kendall was often in China. They received training in cipher and intelligence work, weapons, wireless and explosives. They also spent much time literally walking through the scrub land, often in the dark, getting to know the trails and terrain in preparation for the day they would have to work behind Japanese lines. Weapons were stored in Kendall’s bungalow near Shing Mun, where Holmes and Teesdale lived for extended periods. They also set up hidden stores for supply in the event of a prolonged campaign behind Japanese lines. The Japanese found the main store, in a cave on Tai Mo Shan about 1800 feet up on the south east slope. Another was in an old lead mine at Lim Ma hang, near the border at Sha Tau kok. It was later raided by villagers, who would have seen troops of Indian soldiers carrying supplies there on mules. On the outbreak of battle, Col Newnham ordered Kendall and McEwan out of the New Territories and into Lyemun Pass, to fix limpet mines to scuttle a ship being used by the Japanese as an observation post. The remaining men in the New Territories, led by Holmes and Teesdale, spent a month behind Japanese lines, crossing back and forth across the border, collecting information, setting up contacts and reconnoitering. By the 18th of December Kendall was told to do a quick feasability study for supplying small arms to Chinese guerrillas north of Hong Kong. But events were moving rapidly against the defenders and the proposed small arms supply to the Chinese Guerrillas was abandoned after the Imperial Government in London instructed that the Chinese military mission headed by Admiral Chan Chack must be extracted to safety in Free China before the Colony was overwhelmed by the IJA, at all costs. Kendall went through an ancient blood brother ritual in Waichow with the guerilla leader Liung Wingyuan before they departed. After the escape Kendall and his team continued their work in Southern China operating from Kukong. Unlike his two colleagues FWK was recommended for the George Medal, but his ties with the Communist Chinese got in the way and he never received any official recognition for organising the Christmas Day Hong Kong escape. Paul Tsui of the BAAG wrote "Doc Ride was not the only British "military presence" in Kukong at the time. Up north, a mile away near Ng Li Ting, ( ), tied by the East Bank of the Western River, was a pair of house-boats. Here over half a dozen of British service personnel were "camping". They had earlier on escaped from Hong Kong. They were headed by Mike Kendall, a Canadian, who was the commanding officer of a unit known as S.O.E. Apparently, the unit was a Special Duty Unit of the Hong Kong Defence Force. One of its tasks was to harass the enemy from behind the lines by a system, of sabotage, espionage and intelligence; they were to blow up bridges or other forms of communications behind the enemy line, when Hong Kong was attacked. In the group were some outstanding young individuals; including (a) R.G.K. 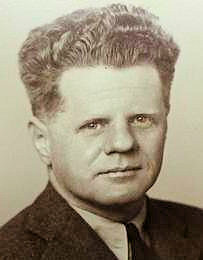 (Bobby) Thompson, (later Sir Robert) who eventually became a World Authority on Communist and Communist Tactics, (b) Colin McEwan, to whom I was introduced by Hector MacKenzie, at the University of Hong Kong, Maxwell Holroyd, formerly of the Chinese Maritime Customs and a few others. Their aims were similar to those of Doc Ride, but their methods were apparently different. The S.O.E. 's method was apparently that of the commando, by blowing up any obstacles with light machine guns or explosives as may be necessary, to achieve an objective. The method itself is dependent upon the availability of the necessary logistics. The political climate at the time, for the intended areas of operation, simply made the S.O.E. method a non starter. Amongst others who were also members of the S.O.E., was one Mr. E.B.Teesdale, of the Colonial Administrative Service, who eventually rose to become the Colonial Secretary of Hong kong". In 1944 the Canadians set up a training camp in the Okanagan Valley approximately ten miles north of Penticton, British Columbia Commando Bay. 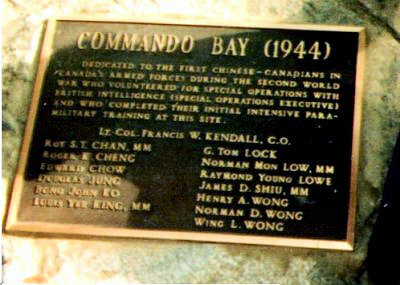 Major Kendall was appointed Commanding Officer to train Chinese Canadians for covert action in South East Asia for Operation Oblivion. This group were known as the Kendall group. d) Photographing landing places and beach underwater defence's. f) Performing coast watching duties and g) carrying on anti-Japanese propaganda activity. Mike passed away in Hong Kong aged sixty six in 1973. A full version of the interview is held in the digital archives at the University of Victoria in Canada.